The American online network “One America Network” committed the unpardonable sin for the mainstream media and actually went to the site of the alleged chemical attack in Syria which prompted the bomb and missile attack by France, the UK and USA. They found no trace of chemicals. They found no one suffering from chemical poisoning. They found no one who thought there had been a chemical attack. The network interviewed about 10 locals living within one and a half blocks of the alleged attack and none of them had seen or heard anything. They visited the former rebel HQ which was piled high with mortar shells and mortars. Then they saw a long queue of people waiting for food and water and randomly interviewed 30-40 people all of whom were residents of the area. 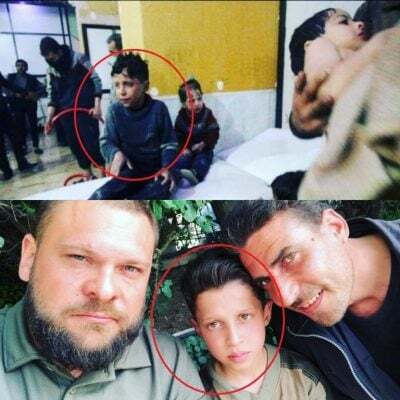 All said that there was no chemical attack but that the fraud had been staged by the rebels who were under intense pressure and wanted to get the Syrian Government forces “off their back” so they could escape from Douma. The US reporter asked the people what they thought of Assad. They said they loved him, were grateful for the relief of the town and that they thought there were “no moderate rebels”. They had suffered starvation and lack of medicines under the extremist group Jaysh al Islam and if anyone complained they were threatened with death. “Some of [the victims] suffered from asthma and pulmonary inflammation. They received routine treatment and some were even sent home, they showed no symptoms of a chemical attack. “I was with my family in the basement of my home three hundred metres from here on the night but all the doctors know what happened. There was a lot of shelling [by government forces] and aircraft were always over Douma at night – but on this night, there was wind and huge dust clouds began to come into the basements and cellars where people lived. People began to arrive here suffering from hypoxia, oxygen loss. One of the children filmed being doused with water was 11 year old Hassan Diab who always looked more perturbed by the water than anything else. He was back home by the evening and is apparently fine with no health effects and his father told Russian journalists that his son was rewarded for his efforts with rice, dates and cookies! The boy’s father heard that his family had been urged by rebel fighters to go to the hospital. He had been working and smoking in the street but had smelt no gas or chemicals. When he got to the hospital his family were safe and there was nothing wrong with them. You can watch the video of the father’s evidence here. While the Russian objections to the OPCW report on the Scripal poisoning does not stack up (although there is still no direct evidence of Russian State involvement as Theresa May claims) the evidence on the ground in Douma is very much supportive of the Syrian and Russian denial that any chemical attack ever took place. Since the result of the probable Douma fraud was a major military attack (firing some 100 missiles at Syria) by France, the UK and the USA, it is this alleged chemical attack which is the more serious. Having resorted to extreme military force on the basis of social media and press speculation (with even today virtually no mainstream media on the ground in Douma) the blowback for the western leaders who took part in this unjustified attack could be – indeed should be – very serious. This article was originally published on Freenations.